Under "Participant Status", choose whether to let your newly added participants use the site right away by selecting "Active", or keep them from accessing the site for now by selecting "Inactive". For the default option of "Assign all participants the same role", select the radio button for the desired role and then click Continue. 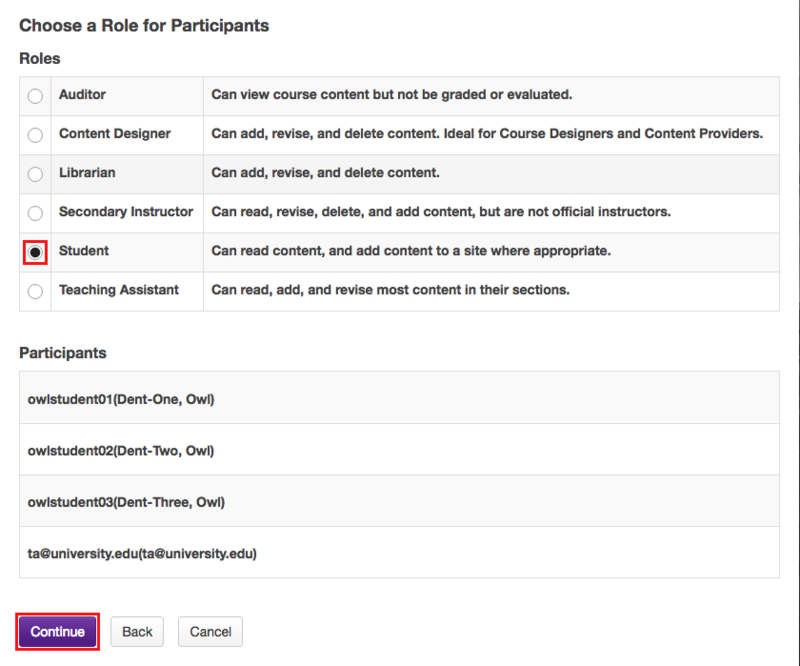 If you chose to "Assign each participant a role individually", use the drop-down menus to the right of the participants' names to select each participant's role, and then click Continue. Select a role for all participants. You may choose the "Send Now" option to send a notification email to participants if desired. The default setting is "Don't send". 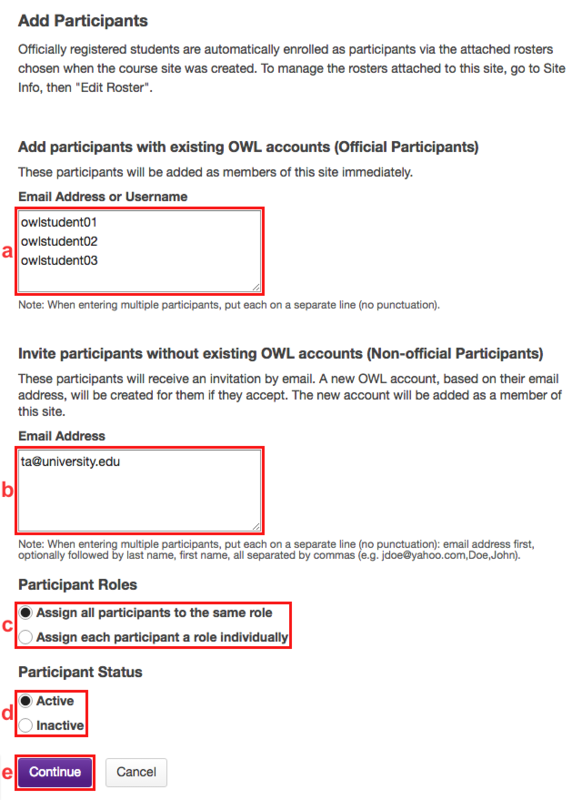 Note: OWL does not destructively delete user data when removing users from a site. Therefore, if you remove a user from your site, and then later reinstate that user, all of the user's activity within the site will remain intact once you add the user back into the course or project. In the "Remove" column, check the box in the row for the user(s) you want to remove from your site. Note: You can remove all users from the site by checking the box at the top of the column right next to the Remove column header. However, be sure that you uncheck yourself so you don't remove your own access! "Name": The name of the user account that was modified. "User ID": The user id of the user account that was modified. 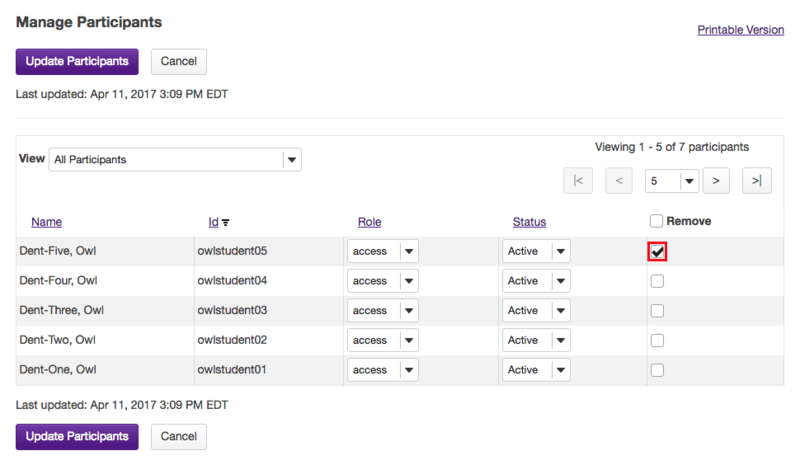 "Role": The role of the user account that was modified. "Date": The date and time that the change was made. "Event": The type of change that was made to the account (i.e. 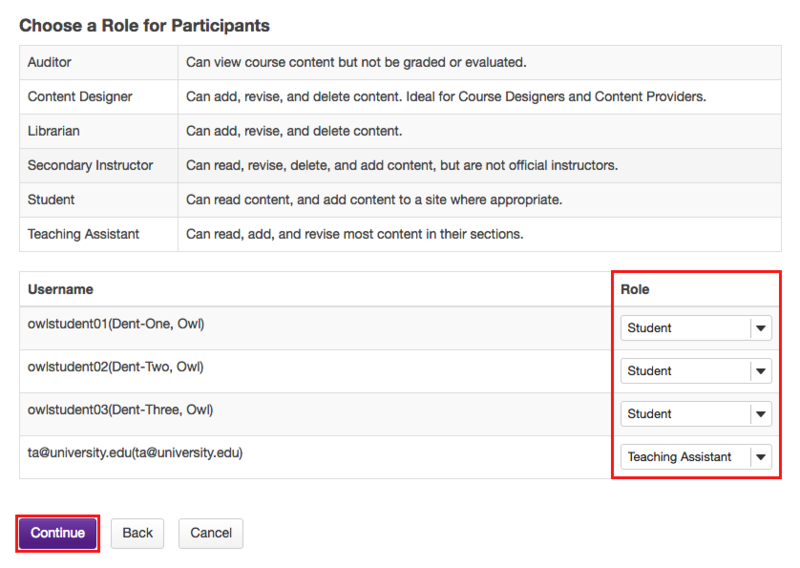 add a user to course, remove the user from course, or update user role). "Source": The name and user id of the account that initiated the event.